The Judicial College of Victoria today released updates to its ever-useful series of manuals. A big "huzzah" to the folks responsible. The College hasn't put out much detail about the changes, but it seems to me that they've moved away from the java-scripting that previously ran them. My guess is they're now using HTML5. Whatever the difference is, they look better, and now support pinpoint and deep hyperlinks. This means it's possible to link to a particular point in the commentary and save that for later, or open it in different browser tab. Previously, opening a link to a pinpoint location failed with a message that the sidebar — the navigation tree on the left-hand side of the screen — was missing. The new manuals seem to be much quicker on the iPad, and to readily support opening pinpoint references in multiple tabs. There are also cross-references to related sections now shown at the bottom of each page, and a built-in search window at the top of the page. The index is also improved, and works without any of the little glitches that were present in Safari on a Mac. The only thing that seems to now be absent is the list of cases. I'd like to see that return, because it was often useful to see the JCV commentary on particular cases, especially when it suggested applications of cases I knew but in different ways or circumstances I had not encountered. The last apparent change is that the manuals are now hosted on the JCV's own site. 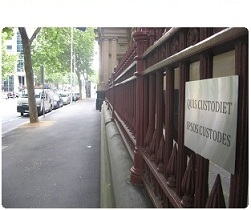 Previously, they linked to a justice.vic.gov.au address (or URL). So if you had the manuals bookmarked anywhere, you'll need to update the bookmarks. Love your work and please keep it up. Just wanted to mention that the Recent Comments do not render right on my iPad. Maybe the problem is at my end but the comments extend into the main text making it a bit difficult to read sometimes. I don't know if there is anything you can do about it but just thought I would let you know. Hey Abi. I saw the same problem myself this week, and it only seems to be very recent. Not sure what the cause is, or more importantly, what the solution is. It's a bit annoying...I'll keep working to find a fix. When Kyle wrote this post it seemed to me that the JCV were only part way through converting their existing material into the new format. Now that they have finished it is well worth giving the Judicial College another look (if you haven't already).